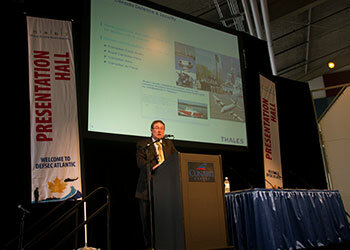 DEFSEC Atlantic is a major networking opportunity for the Aerospace, Defence and Security industries - the second largest of its kind in Canada. Focused on showcasing Atlantic Canadian opportunities, the show's worldwide reach creates partnership potential for all attendees. Incorporating elements of both a trade show and a defence procurement conference, it provides access to "the right people" in an engaging and professional setting. All attendees have opportunities, through our B2B/B2G program, social events and expert panel discussions, to interact with all levels of defence, industry and government participants. As of February 1, we opened up the floorspace for new exhibitors and properties for new sponsors. Exhibitors can express their interest by clicking here and filling out the 2019 Booth Space Registration form. Companies can view available sponsorships by clicking here and if interested, can then contact Colin Stephenson. We have approached all of the presenters for the seminars that took place at last year's event. Several of those presentations are available for download in secure PDF format by clicking here. 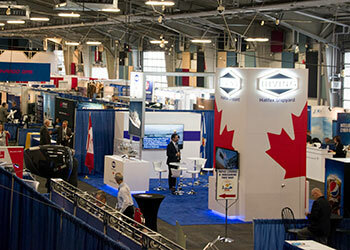 Display your products and services to attendees from all over Canada, North America and around the world. We also accommodate outdoor static and dynamic displays and can even berth a ship alongside the venue. Promote your brand cost-effectively in a wide variety of ways and to a broad audience ranging from industry delegates to academia to government employees and military members. Click below to find out more. A combination of networking opportunities, informative seminars and displays across many different industries. It is large enough to do substantial business, but small enough to take in the entire event through the week.